Expand your angle of view underwater with this 0.6x Wide-Angle Conversion Lens with M67 Screw Mount from Sea & Sea. Designed for use with the Seas & Sea MDX-X10, Nikon WP-N1 & WP-N2, and Olympus PT-EP06L & PT-EP05L underwater housings, this model will offer an angle of coverage of 94° underwater, or 150° on land. Also, it has a depth rating of 197' for deep dives along with the ability to be attached and removed while underwater. The lens is built with an anodized aluminum alloy body to resist corrosion and uses a construction featuring 3 elements in 3 groups. 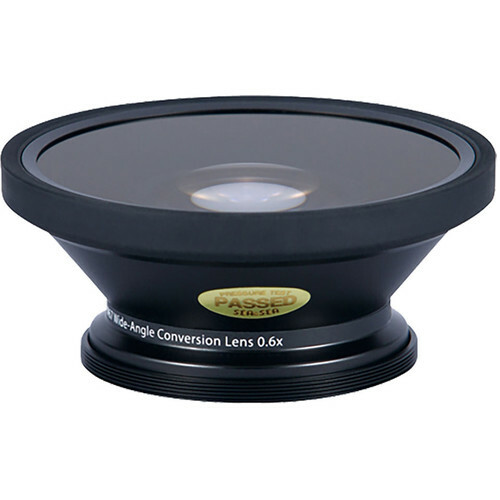 0.6x Wide-Angle Conversion Lens with M67 Screw Mount is rated 1.0 out of 5 by 2. Rated 1 out of 5 by Snoobles from Condensation inside the lens I ordered one of these lenses (which I had used previously and liked how it worked underwater), but when the lens arrived within the sealed portion of the lens there was some condensation on the curved glass interior. I sent it back for replacement and the second one I received also had the same interior sealed area condensation. I then ordered the same lines from another store and received one that did not have the interior condensation. I have use his sons before and like how it operates on my canon G7X with a Recsea housing. B &H was very supportive about the returns the perhaps they just received a bad batch of lenses from the manufacturer. I am a bit disappointed that when I went to get a replacement they didn't check for the same issue in the second one they sent me. Rated 1 out of 5 by Richard L. from Condensation I had this lens a few years ago and condensation would form in the center of the front element whenever I was diving in cold water. So this is not a new problem! It was replaced by Sea&Sea but the replacement had the same problem. It was easy to demonstrate by placing the lens in a pan with ice water. I think they are not using dry nitrogen or dry air when assembling these lenses. I sold the lens for about 20% of its value. Will this still fit onto the case if I were to use a screw-on filter at the same time? I have the Nikon WP-N1 case. That depends on the filter. You would have to try it.Most likely it would not fit. Can I use a 67mm dome on top of this lens? The SEA&amp;SEA M67 is a wet mount lens and not designed to be used behind a Dome Port.